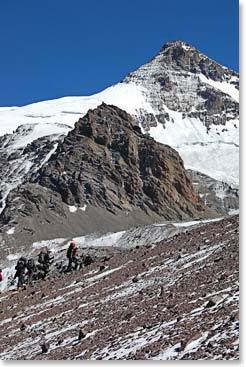 It is 2:30 in the afternoon on February 4th and we are just now putting the finishing touches on our Camp II: Nido de Condor Camp on Aconcagua at an elevation of 18,210ft/5,550m. Nido de Condor means, the Condor’s Nest. As many of you may know, the condor is a majestic bird that flies through the wild Andes, and is the signature image of the wildness, beauty and size of this spectacular mountain range—a truly impressive bird. Here we are, so high in the atmosphere at our camp called the Condor’s Nest, and with luck we will see a condor at these heights. Now, this is our Camp II, as I said. 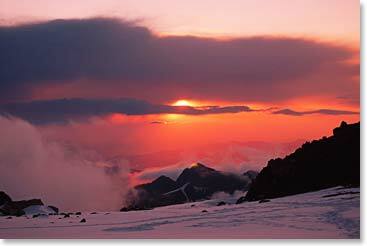 We are following the principle that all good mountaineering expeditions abide by and that is climb high, sleep low. It is all relative; once you adapt to one elevation, you can move up. After two nights down at Plaza Canada, Jussi, myself, Ovsi and the guys feel that we are ready to begin sleeping at this new elevation at Nido de Condor Camp. Jussi really likes the expedition living here on Aconcagua and he has adapted very well. The two signs I look for in climbers is being able to sleep well and having an appetite. Two symptoms of Acute Mountain Sickness are insomnia, lack of sleep, and no appetite. Jussi has problems with neither. Last night he slept 11 hours without waking, and this morning I watched him eat a huge pancake breakfast that Simon prepared for him. We have a lot of downtime on the mountain. Jussi reports that he is doing math, he is content with sitting in his tent or off on a rock somewhere in the sun at high altitude. I can tell he is really enjoying this time in the mountains. It is a physical challenge and it is a mental challenge because you’ve got to keep patient, but it is also a great opportunity to clear your head and let thoughts develop. I can tell that Jussi is really taking advantage of the situation. Jussi really loves one spot in our camp and that is Simon’s kitchen. Simon has the largest tent, and he prepares his meal out in the vestibule, or the opening of the tent. When he’s done cooking, the rest of us often pile in and have our meals inside. Jussi told us that if climbing Aconcagua were a bank robbery, a heist, and reaching the summit meant pulling off a successful operation, Simon would be the safe cracker. Simon would be the technician whose skills the team needs to successfully pull off the heist and stand on top of Aconcagua. It might not make a lot of sense to most people, but Jussi and I have laughed a lot about this and we now call Simon our safe cracker. Well, it is going to be a beautiful afternoon and evening here. We’ve seen some of the most spectacular sunsets you can imagine from all of our camps and I think it will be even better tonight. We still have a long way to go, but as you can tell we are living well and enjoying life on Aconcagua as we climb higher and higher.